"Olivier and Evening Standard award-winning dancer, director and choreographer Peter Schaufuss presents the UK Premiere of his acclaimed ballet Midnight Express, an original production based on Billy Hayes's bestselling 1977 book. The dance world's most original choreographer partners with the former Royal Ballet prodigy and the dance world's most outspoken young star, Sergei Polunin, along with the current Artistic Director of Stanislavski Ballet, dance superstar Igor Zelensky. 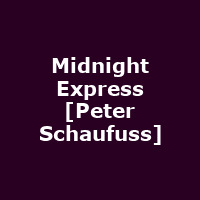 Midnight Express is performed to a specially conceived and mastered sound track."